This charming apartment is part of a large holiday park. There are large houses in the park, containing a number of apartments. The apartment boasts a neat and tidy design, complete with authentic details such as wooden ceiling beams. There is a large swimming pool, a barbecue and a washing machine, all of which are shared with the other residents. The park, which is surrounded by pastureland, has its own restaurant on the grounds, where you can go for a delicious dinner. 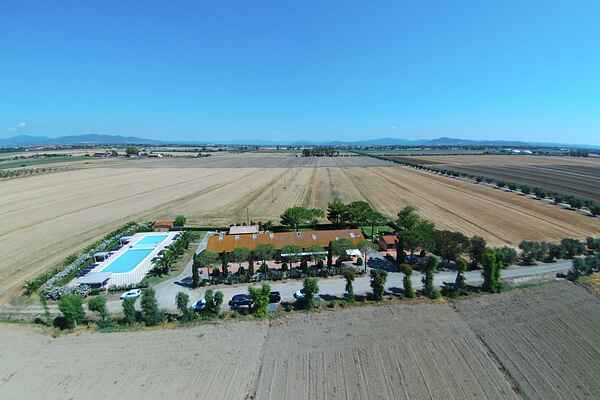 The apartment is located about 3 kilometres from the charming village of Grosseto. The Tuscan coast is just 7 kilometres away. This is where you will find the lovely little beach town of Principina. The beautiful coastal region dates back to Etruscan times, and you will find fantastic excavations from this era all throughout the surrounding area. There is even an archaeological park here, named Park Roselle, which is a great destination. If you would like to explore a bit farther afield then beautiful Orbetello (45 km) is definitely worth a visit. This wonderful ancient town has a charming centre with nice shops and a beautiful cathedral. A dike provides access to Agentatio. You can tour the area on lovely drives and stop off in Porto Ercole and Porto San Stefano.